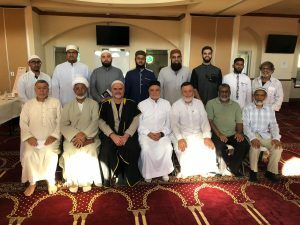 (Miami Gardens, FL, 03/23/2019) – This past Saturday, March 23rd, 2019, the South Florida Muslim Federation’s Council of Imams held its second meeting at the Islamic Center of Greater Miami. 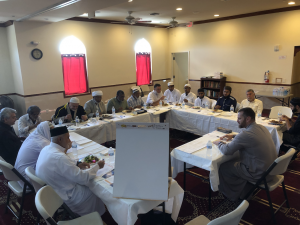 In attendance were imams and leadership from Nur Ul Islam of South Florida, ICSFL, Masjid Ihsaan, IJA, Darul Uloom, Al-Hijar, Islamic Center of Weston, Madinatul Uloom, IFSF, MJAM, AICF, ICBR, and MCPBC. outreach to communities of other faiths, and more. Given these issues, the Imams came together to unite on social issue that they will address through one Friday khutbah within the next few months. In this meeting the issue agreed upon will be Youth Identity, and InshaAllah it will be discussed on an upcoming Friday at a masjid near you. 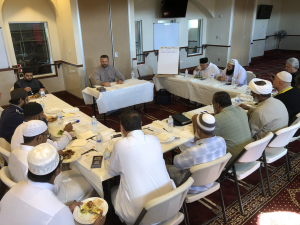 The meeting was extremely successful in having imams from all over south Florida meet, dialogue, and share ideas on issues that affect the whole community, regardless of individual masjid. The Council of Imams will be meeting quarterly and will continue to work on projects throughout the rest of the year. The Federation will continue to keep you updated on this wonderful effort towards greater unity!